Albuquerque Public Schools (APS) is a school district based in Albuquerque, New Mexico. Founded in 1891, APS is the largest of 89 public school districts in the state of New Mexico. In 2010 it had a total of 139 schools with some 95,000 students, making it one of the largest school districts in the United States. APS operates 89 elementary, 27 middle, and 13 high schools, as well as 10 alternative schools. They also own the radio station KANW and co-own the TV stations KNME-TV and KNMD-TV along with the University of New Mexico. Albuquerque Public Schools was founded in 1891, shortly after the New Mexico Territorial Legislature passed a new public education law authorizing municipalities to establish school boards and sell municipal bonds for school construction. 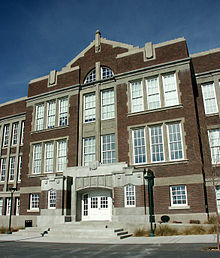 The district acquired its first school by taking over the former Albuquerque Academy at Central and Edith, and classes began that fall. Primary schools were established in each of the city's four political wards in the early 1890s, and a new Central School for the upper grades opened in 1900. In 1911, the district appointed superintendent John Milne, who oversaw the school system until 1956 and was credited with much of its success. With the city continuing to grow rapidly, a new high school building was constructed in 1914. Critics complained that the school was too large and would never reach its capacity of 500 students, but this proved not to be the case as a second building was required just 13 years later and the campus had grown to five buildings by 1940. In 1923 the district added two junior high schools, Washington and Lincoln, and two elementary schools at the expanding fringes of the city, John Marshall in the south and University Heights in the east. The outdated old ward schools were phased out between 1927 and 1937, to be replaced by Longfellow, Eugene Field, Coronado, and Lew Wallace elementary schools, respectively. The district continued to expand with the city's growth to the east, adding Monte Vista Elementary in 1931, Jefferson Junior High in 1938, and Bandelier Elementary in 1939. Albuquerque's population exploded in the postwar era, and APS had to add new schools continuously to keep up, including the city's second high school, Highland, in 1949. APS also took over the Bernalillo County public school system that same year, bringing in schools in the older rural communities along the Rio Grande valley and in the mountains. In 1956 the district boasted 39,000 students and 67 schools, the two most distant of which were 52 miles (84 km) apart. Declining enrollments saw several inner-city schools closed in the 1970s, and Albuquerque High moved to a new location farther from Downtown. Nevertheless, the district as a whole continued to grow, and more recent demographic shifts have seen Coronado and Lew Wallace elementary schools reopen. In 1994, the Rio Rancho schools were spun off as a separate school district. In 2010, APS recorded nearly 100,000 students. As of 2017, APS operates 88 elementary schools (grades K–5), 27 middle schools (grades 6–8) and 13 high schools (grades 9–12). The following list is adapted from the APS website. ^ "Table 104. Enrollment, poverty, and federal funds for the 100 largest school districts, by enrollment size in 2010: Fall 2010, 2009-10, and federal fiscal year 2012". Digest of Education Statistics 2013. U.S. Department of Education: Institute of Education Sciences, National Center for Education Statistics. January 2013. Retrieved July 25, 2015. ^ "U.S. Territorial Education, 1846–1912". Albuquerque Historical Society. Retrieved July 25, 2015. ^ a b "U.S. Statehood Education, 1912-1945". Albuquerque Historical Society. Retrieved July 25, 2015. ^ a b c d e "39,000 Children Count Days Again Until School Opens". Albuquerque Journal. August 19, 1956. p. 19. Retrieved August 8, 2015 – via Newspapers.com. ^ "School Directory". Albuquerque Public Schools. Retrieved July 24, 2015. ^ a b c d "A new 20-classroom elementary school". Albuquerque Journal. August 21, 1964. p. G10. Retrieved August 8, 2015 – via Newspapers.com. ^ "New City School to be Inspected". Albuquerque Journal. September 27, 1962. p. B4. Retrieved August 8, 2015 – via Newspapers.com. ^ "County School System to Open Its First Junior High Next Fall". Albuquerque Journal. April 16, 1948. p. 9. Retrieved August 8, 2015 – via Newspapers.com. ^ a b c d e f g h i j k l m n o p q r s t u v "County schools office 'dies' tonight with merger in effect". June 30, 1949. p. 1. Retrieved April 4, 2017 – via Newspapers.com. ^ "Opening Today For City's First Combined School". Albuquerque Journal. March 2, 1962. p. A6. Retrieved August 8, 2015 – via Newspapers.com. ^ a b "School Dedication Sunday". Albuquerque Journal. April 4, 1968. p. C1. Retrieved August 8, 2015 – via Newspapers.com. ^ "Anatasio Montoya School at Tijeras inspires pride in pupils and faculty". Albuquerque Journal. February 25, 1949. p. B1. Retrieved April 4, 2017 – via Newspapers.com. ^ a b c d e f g Montoya, A. (1924). "The Consolidated Schools of Bernalillo County New Mexico". Rural School Leaflet. U.S. Department of the Interior. 22. Retrieved July 18, 2015. ^ a b "County Schools to Eliminate Railroad Crossings by Buses Next Fall". Albuquerque Journal. April 20, 1948. p. 2. Retrieved August 8, 2015 – via Newspapers.com. ^ a b "National Register of Historic Places Registration Form: Old Armijo School" (PDF). National Park Service. Retrieved July 18, 2015. ^ a b "School Plans Open House". Albuquerque Journal. March 14, 1975. p. B10. Retrieved August 8, 2015 – via Newspapers.com. ^ "Atrisco School's Annex Dedicated; Donors Honored". Albuquerque Journal. September 25, 1936. p. 4. Retrieved August 8, 2015 – via Newspapers.com. ^ a b c "Public School Zones Undergo Some Changes". Albuquerque Journal. August 28, 1952. p. 4. Retrieved August 8, 2015 – via Newspapers.com. ^ a b "APS Officials Plan To Inspect Addition". Albuquerque Journal. September 28, 1966. p. C3. Retrieved August 8, 2015 – via Newspapers.com. ^ "National Register of Historic Places Registration Form: Coronado School" (PDF). National Park Service. Retrieved July 24, 2015. ^ Davis, Mary P. (2010). Corrales. Charleston, SC: Arcadia. p. 92. ^ "Work on New San Jose School". Albuquerque Citizen. March 13, 1908. p. 7. Retrieved August 12, 2015 – via Library of Congress. ^ "New City Grade School Named for Emerson". Albuquerque Journal. September 7, 1952. p. 24. Retrieved August 8, 2015 – via Newspapers.com. ^ a b "Officials to See New Elementary Schools Today". Albuquerque Journal. March 26, 1954. p. 34. Retrieved August 8, 2015 – via Newspapers.com. ^ "Bids on Moving Buildings Opened". Albuquerque Journal. September 22, 1956. p. 2. Retrieved August 8, 2015 – via Newspapers.com. ^ a b "Before/After". Albuquerque Journal. August 14, 1958. p. 30. Retrieved August 8, 2015 – via Newspapers.com. ^ "NE School Roof Falls; Classes Out for Week". Albuquerque Journal. February 8, 1968. p. A16. Retrieved August 8, 2015 – via Newspapers.com. ^ "Old Armijo Anniversary". Albuquerque Journal. May 5, 1954. p. 9. Retrieved August 8, 2015 – via Newspapers.com. ^ a b "MacArthur School Will Open Soon". Albuquerque Journal. March 30, 1948. p. 11. Retrieved August 8, 2015 – via Newspapers.com. ^ a b "City schools have largest staff in history". Albuquerque Journal. September 3, 1948. p. 11. Retrieved April 6, 2017 – via Newspapers.com. ^ a b "La Mesa Presbyterian Church: History". Retrieved July 20, 2015. ^ "Lavaland School to Open Monday". Albuquerque Journal. January 2, 1946. p. 6. Retrieved August 8, 2015 – via Newspapers.com. ^ Schoellkopf, Andrea (April 22, 2005). "Downtown School Celebrates Past, Future". Albuquerque Journal. Retrieved July 23, 2015. ^ "Los Padillas School Ready". Albuquerque Journal. April 1, 1965. p. D3. Retrieved August 12, 2015 – via Newspapers.com. ^ Chavez, Helen. "Early History of the Mountain View School" (PDF). Albuquerque Public Schools. Archived from the original (PDF) on 2015-09-23. Retrieved July 19, 2015. ^ Schoellkopf, Andrea (September 25, 2010). "CNM Celebration". Albuquerque Journal. Retrieved July 20, 2015. ^ "Creditable Act". Albuquerque Citizen. August 27, 1904. Retrieved July 20, 2015 – via Library of Congress. ^ "New Schools Are Needed". Albuquerque Journal. February 6, 1955. p. 30. Retrieved August 8, 2015 – via Newspapers.com. ^ a b "School Enrollment Shows 13 Per Cent Increase Over '48". Albuquerque Journal. August 31, 1949. Retrieved January 2, 2019 – via Newspapers.com. ^ a b c d "Fire and School Officials Decry Use of Barracks". Albuquerque Journal. August 7, 1958. p. 2. Retrieved August 8, 2015 – via Newspapers.com. ^ Burgess, Kim (August 5, 2016). "Merger of two schools hailed as a success". Albuquerque Journal. Retrieved October 24, 2017. ^ a b Dodge, William A. (2013). "A Survey of Albuquerque's Mid-Century Modernist Architectural Resources" (PDF). City of Albuquerque. Retrieved July 18, 2015. ^ "Facts Being Distorted". Albuquerque Journal. June 4, 1975. p. A4. Retrieved August 10, 2015 – via Newspapers.com. ^ "Enrollment Up 3749 This Year". Albuquerque Journal. September 3, 1955. p. 9. Retrieved August 10, 2015 – via Newspapers.com. ^ "Local Paragraphs". Albuquerque Daily Citizen. September 5, 1900. p. 4. Retrieved July 24, 2015. ^ "Directors Oppose Donating School Land For Auditorium". Albuquerque Journal. January 20, 1937. p. 5. Retrieved August 10, 2015 – via Newspapers.com. ^ a b Piper, Ann (2014). Education in Albuquerque. Charleston, SC: Arcadia. ^ a b c d "Parents busing to school". Albuquerque Journal. March 26, 1972. p. F10. Retrieved April 4, 2017 – via Newspapers.com. ^ a b c d e "APS in action". Albuquerque Journal. Supplement to the Albuquerque Journal and Tribune. May 26, 1982. Retrieved December 5, 2017 – via Newspapers.com. ^ a b c d e f "Boundary Changes Mark Start of Long-Range Plan". Albuquerque Journal. August 12, 1973. p. E14. Retrieved August 10, 2015 – via Newspapers.com. ^ "School Profile: Ernest Stapleton Elementary". Rio Rancho Public Schools. Retrieved July 22, 2015. ^ "Five Points School Enrollment is 206; New Room Is Added". Albuquerque Journal. September 12, 1931. p. 2. Retrieved August 10, 2015 – via Newspapers.com. ^ "John Marshall School". Henry C. Trost Historical Organization. Retrieved July 23, 2015. ^ "Marshall Center Opening Is Today". Albuquerque Journal. August 9, 1975. p. A10. Retrieved August 10, 2015 – via Newspapers.com. ^ "School Profile: Lincoln Middle School". Rio Rancho Public Schools. Retrieved July 22, 2015. ^ "School Profile: Martin Luther King, Jr. Elementary". Rio Rancho Public Schools. Retrieved July 22, 2015. ^ "For Old Times' Sake". Albuquerque Journal. August 17, 1988. ^ Nguyen, Jeannie (October 18, 2016). "Former Montgomery Elementary students dig up 1968 time capsule". KRQE News. Retrieved April 6, 2017. ^ "Cost operating county schools to be $192,200". Albuquerque Journal. May 9, 1928. p. 7. Retrieved April 6, 2017 – via Newspapers.com. ^ "About Us". St. Thomas Aquinas School. Retrieved July 22, 2015. ^ "School Profile: Puesta del Sol Elementary". Rio Rancho Public Schools. Retrieved July 22, 2015. ^ "School Profile: Rio Rancho Elementary". Rio Rancho Public Schools. Retrieved July 22, 2015. ^ "National Register of Historic Places Registration Form: Santa Barbara School" (PDF). National Park Service. Retrieved July 23, 2015. ^ "Physical school change on agenda". Albuquerque Journal. April 27, 1975. p. E10. Retrieved April 4, 2017 – via Newspapers.com. ^ a b "National Register of Historic Places Registration Form: Santa Barbara School" (PDF). National Park Service. Retrieved July 18, 2015. ^ Sabatini, Joe (2011). "History of the Near North Valley". Near North Valley Neighborhood Association. Retrieved July 20, 2015. ^ Burks, Susanne (May 31, 1975). "Disposal of Schools Approved". Albuquerque Journal. p. A7. Retrieved August 10, 2015 – via Newspapers.com. ^ Schoellkopf, Andrea (May 8, 2009). "APS Demolishing, Rebuilding". Albuquerque Journal. Retrieved July 18, 2015. ^ "Ideas Given For Moving City School". Albuquerque Journal. February 28, 1969. p. A4. Retrieved August 10, 2015 – via Newspapers.com. ^ "U.S. Statehood Education, 1912-1945". Albuquerque Historical Society. Retrieved July 18, 2015. ^ "University Heights School Will Close". Albuquerque Journal. March 28, 1962. p. A2. Retrieved August 10, 2015 – via Newspapers.com. ^ "K.L. House Low Bidder on APS Job". Albuquerque Journal. November 30, 1973. p. C10. Retrieved August 10, 2015 – via Newspapers.com. This page was last edited on 2 January 2019, at 15:27 (UTC).